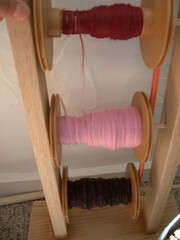 I didn’t think I was going to be able to show much today, so I had taken some pictures of what I’ll be spinning next. 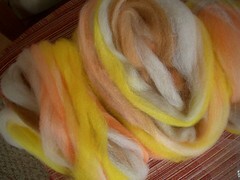 This is some Corriedale roving that I bought from Perchance to Knit‘s roving destash a few days ago. I was so excited about it that I started drafting it right away, I didn’t even take a “before” picture. The lightest color is actually a silver. Although these colors are very unlike what I’m drawn to I loved the mix of the brown, orange, yellow and silver. Although I was prepared to only show you the new roving I decided that I would finish spinning up the pink merino and I did. 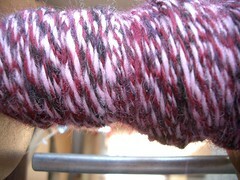 And I couldn’t even wait to finish spinning the purple roving, I had to see what the 3-ply would look, right away.